Working with beautiful vintage embroidery patterns can take you back in time while you create a meaningful keepsake to pass down in your family. In many categories, vintage is a somewhat murky term. For example, vintage electronics and gaming systems are typically newer than other vintage items due to the rapid advancements in electronic technology that took place in the 1990s. To put it in official terms, most vintage items are between 20 and 100 years old. However, vintage patterns and fabrics usually originate from the mid 20th century. Items that are older than 100 years are officially antiques. Creative vintage crafting is chic, which unfortunately means that unscrupulous people can tag anything with the term, even if the item has a contemporary appearance. Fortunately, the Internet has attracted a multitude of needle crafters who are eager to share their vintage patterns as well as more modern patterns that bear a distinct vintage look. The sections below contain links to embroidery patterns that are either truly vintage, or authentically vintage-looking. Some of these offerings are free while others are for sale. Finding quality free stuff is always a good thing. The patterns shared at these websites are available at no cost and can be downloaded or copied directly to your computer in several formats. Knit Heaven Embroidery Index: Here, you can find a large assortment of true vintage patterns, vintage stitches and embellishments, and a detailed set of embroidery instructions. Vintage Craft Patterns: This site also features a large page of free embroidery patterns from past eras, as well as stitch instructions and basic embroidery directions. Needlecrafter: The free embroidery patterns at Needlecrafter are organized by categories like art nouveau and deco, alphabets and monograms, cottages, fantasy, holidays, and landscapes. Baby Bloggie: Recreate the adorable baby items of the vintage era with the free patterns available here. Molly's Place: The vintage spirit is alive and well at Molly's place. The site offers a variety of cute embroidery patterns that are truly vintage. Pattern Bee Free Section: This site includes categories like towels, potholders, Christmas designs, nursery rhymes, flowers of the month, and vintage variety. Craft Gossip: Choose from babies, flowers, vogart, China maiden, birds, peasant girl dishtowels, and Dutch boy and girl. My Transfers: Get detailed and well-rendered vintage transfers for needlepoint or embroidery here. Free Embroidery Patterns: This blog features vintage embroidery patterns from Beeton's Book of Needlework, circa 1870. Average Jane Crafter: You'll find a few unusual vintage patterns at Jane's blog. Patterns include car with trees, a fairy, and a group of squirrels. Secrets of Embroidery: If you need vintage embroidery squares for a large product, check out the offerings at Secrets of Embroidery. They offer an array of vintage square designs, with or without stippling. If none of the free embroidery patterns are appealing, you can also buy many vintage patterns online. Take a look at the pattern vendors listed below to get started. Sew Fun Patterns: Choose from vintage embroidery patterns of the 1920s, 30s, and 40s. Designs include several "days of the week" patterns, Scotty dog patterns, kittens, and cowboys. Pattern Bee Embroidery Shop: Bygone days spring to life with Pattern Bee's beautiful vintage transfers and PDF formatted patterns. The patterns are categorized and easy to sort through. Sandy Creel Collectibles: At Sandy Creek, you can select from three pages of true vintage hot iron transfers in a variety of categories. Grandma's House: You'll find two pages of true blue vintage patterns when you pay a visit to Grandma's House. These are actual, unused patterns from the mid 20th century. Stitchin Kitchen: Reprinted vintage designs like puppies, elephants, chickens, and children are featured at Stitchin' Kitchen. Get in on the fun and embroider something vintage today. 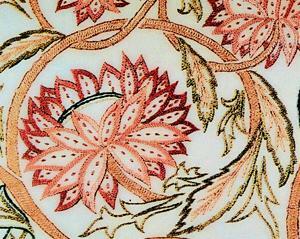 For more embroidery resources, browse the articles listed below.